Ontario's Marineland is home to the Dragon Mountain roller coaster, the Sky Screamer triple tower, and the "Ocean Odyssey" rides. It is also home to more than 4,000 live land and sea animals and a whole lot of controversy. Over the last few years, the "amusement" park has come under public scrutiny for the several high profile marine deaths stretching throughout their nearly 60-year history. No one noticed until a video of one of his performances went viral. The 2016 video showed Zeus to be a mere shell of his former self; he was emaciated and nearly collapsed during one of his performances. But that didn't stop Marineland from continuing to use him in their shows. Life in captivity for Zeus was no walk in the amusement park. He suffered from chronic regurgitation which arose from stress from captivity. His disorder meant that he couldn't properly digest food and it left him "so undernourished that his hip bones and spine stuck out." In a statement last week, Marineland said that the necropsy performed on Zeus revealed he died of natural causes. But one of Zeus's former trainers, Phil Demers, isn't buying it. He told the Dodo that Zeus "had been ill for as long as [he'd] known him" — around 15 years. 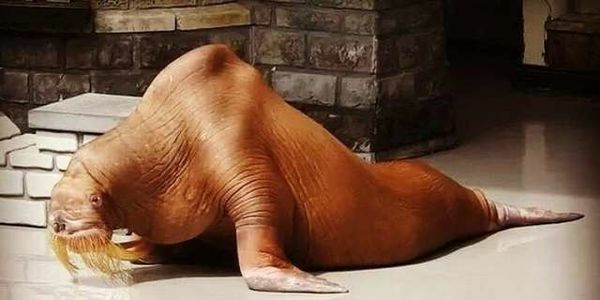 Whatever the reason, Zeus like Marineland's other animals should never have been kept in captivity in the first place. These animals are literally dying to be free and we must help.